Toyota 86 vs. Supra vs. Lexus RC - How Are They Alike? How Do They Differ? We do a breakdown of three sporty cars from Toyota/Lexus. Here's how they match up. Toyota's new Supra brings the number of rear-drive, front engine sporty coupes in the Toyota/Lexus family to three (or four if you consider the LC sporty). We break down the three cars and compare and contrast them from a fan's point of view. Which are best at what? And at what price point? Clearly, all three are coupes. That is clear from the image. However, the 86 and RC are four-passenger coupes and the Supra is a 2-seater. The RC and 86 both have a rear seat, which is handy if you have occasional passengers. It's also a handy place to store a jacket. All three are also front-engine, rear drive. The RC is also available with all-wheel drive (except whenit has the V8). Is there another automaker with three rear-drive coupes? Make it four. There is the LC lluxury-tourer from Lexus to consider as well. The RC is the biggest of the three and rides on the longest wheelbase. The 86 has the second longest wheelbase and is shorter by a few inches than the Supra in outside length. The 86 uses a horizontally-opposed four-cylinder engine. If you've driven it, you know it is a low-torque engine that every enthusiast wants to be stronger. The RC offers multiple engines including a turbo four, V6, and V8. The new Supra uses BMW's inline 3-liter engine. The BMW's engine is stout. Great torque and also great power. Of the three, only the 86 offers a manual transmission. So, if you are an older enthusiast, or just like throwback technology, you can get one in the 86. In the 86 you need the stick, because the H4 has no guts down low. The autos don't drive that well. They are fine cars, just not fun. The Supra and RC cars all offer 8-speed automatics with paddle shifters and rev-matching on downshifts (of course). The RC F has an adaptive automatic that is amazing on track. We found it to be one of the car's best attributes in track testing. The RC line covers many different personalities. The base cars are not that sporty. The all-wheel drive cars are compromise cars for folks in snowy areas. The rear-drive (only) RC F is a beast that can also make for a fantastic grand tourer. The 86 is a sports car through and through. For better and for worse. It's a car you think you can drive to work everyday, and you can, but it is not comfortable for that duty. It's fun on track, except you keep thinking "this would be perfect with more low-end torque and about 50 more hp." We can't say how the Supra will feel until we test it. 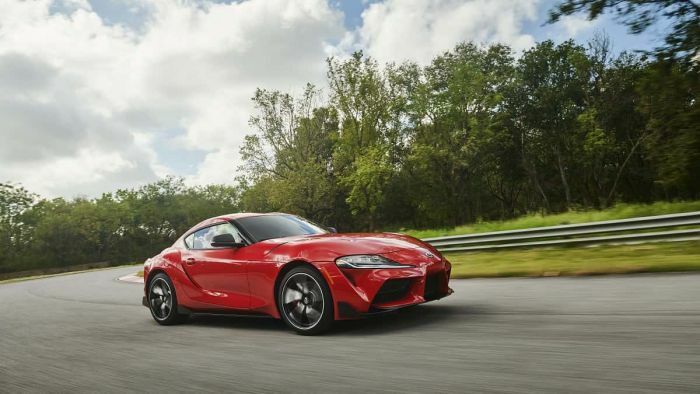 Toyota's new Supra brings the number of rear-drive, front engine sporty coupes in the Toyota/Lexus family to three. We break down the three cars and compare and contrast them from a fan's point of view. Which are best at what? And at what price point? All three are coupes. That is clear from the image. The Supra is a 2-seater. The RC and 86 both have a rear seat, which is handy if you have occasional passengers. It's also a handy place to store a jacket. All three are also front-engine, rear drive. The RC is also available with all-wheel drive. Is there another automaker with four rear-drive coupes? The RC is the biggest of the three and rides on the longest wheelbase. The 86 has the second longest wheelbase and is shorter by a few inches than the Supra. The RC is a super-low volume line for Lexus. In November, Lexus sold 239. In a good month, Toyota sells 400 86s. The Supra will have a spike of sales for its first six months and then disappear in sales, dropping off to about this level. There is no single target buyer type for these cars. At Lexus the target is younger, single and newly married folks and also retired buyers. The 86 is pointed at young buyers stretching to buy a true sports car and folks who want to track it. We can't figure out who the Supra is pointed at. Maybe a BMW shopper who wants a harder edge at a 20% discount. The 86 is a sort of sports car, but without the real performance chops. The RC is as good a grand tourer as exists today, and the Supra will be a pure sports car for more mature drivers. Not a lot of kids have $53K to spend on a car. Think of the Supra as a track car for the street. All three are also front-engine, rear drive. The RC is also available with all-wheel drive. Is there another automaker with three rear-drive coupes?